➫ How to send bulk sms from android mobile on mac? Step1 : Load Recipient Number to load Contacts from file or Add or Paste numbers manually. Click on 'Mobile Phone Connection Wizard' to start establishing connection between mobile device and software. Let’s get started sending messaging with Android Bulk SMS Software for Mac to communicate with your friends, colleagues, relatives and other persons. 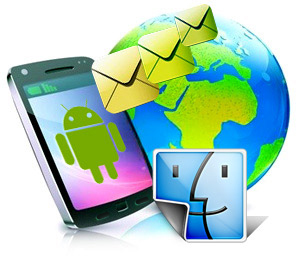 Android Bulk SMS gateway application for Mac is a mobile marketing solution that helps you to promote your products by broadcasting multiple text messages from your android phone connected with Mac machine. Send appointment alerts, share market updates, product launching details, notification, business campaigns, alert, reminders and more. 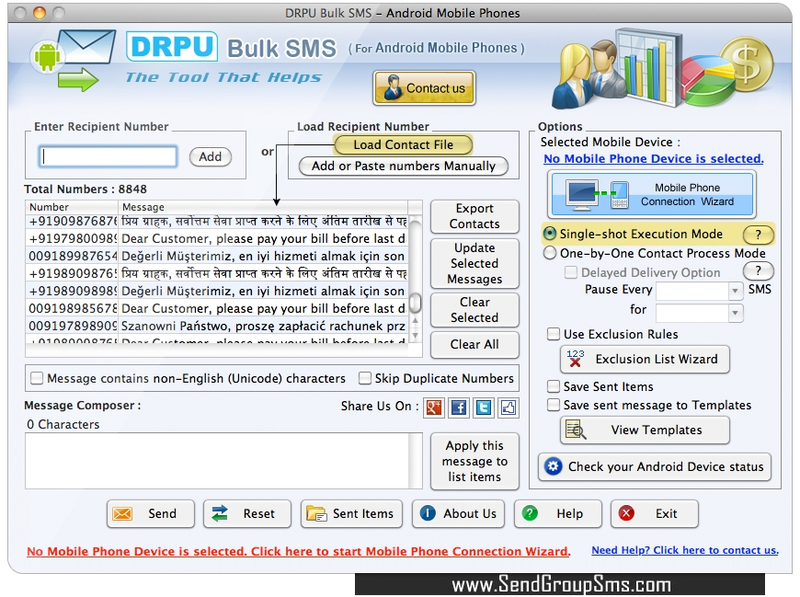 Android text messaging software for Mac provides delayed delivery option to control and manage bulk SMS broadcasting. Without internet connection you can send text messages in different languages using android SMS application. Broadcast offers and discounts to your global mobile audience. Mac text message sending program can instantly send group SMS to single or list of contact numbers from android mobile phone connected with apple Mac OS X machine. Now no need to enter contact number manually, software provides option to load contacts which are saved in text file formats to broadcast multiple text messages simultaneously. SMS broadcasting program for Mac OS X can save all your sent messages details which can be viewed later. Mac group text message broadcasting program automatically skips duplicate number entries during the message sending process.